BCE is very pleased to announce the company has been awarded ISO 9001: 2015 approval. Hayward, California - July 23, 2018 - BCE, Inc., a California based designer and manufacturer of electric thermal systems and vacuum feedthrough devices, announced today that it has been recognized for its commitment to quality and excellence by being certified in accordance with ISO 9001:2015. 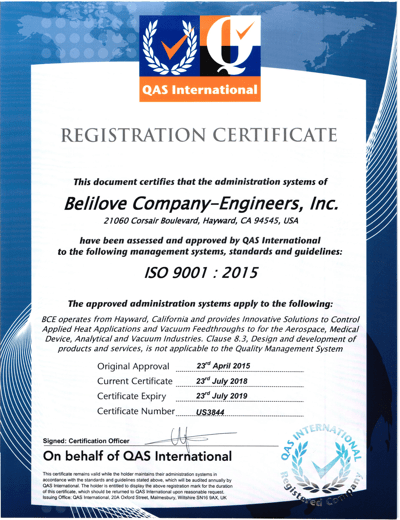 This announcement comes after an extensive audit of Belilove's operations in accordance with ISO standards. The International Organization for Standardization (ISO) is the world’s most widely accepted standard for quality management systems. To gain certification, Belilove had to complete a rigorous auditing process by an independent third-party registrar. 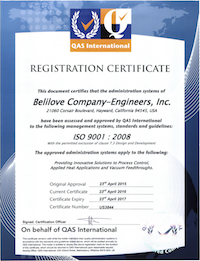 QAS International conducted the audit of Belilove. ISO Certification recognizes businesses for their strict adherence to standards ensuring continual quality and performance improvements pertaining to regulations, business requirements, and customer satisfaction. QAS has been operating within the United States, UK and selected international markets for over 20 years. An award winning consulting firm, QAS provides independent audits and reviews of international compliance standards. It has customers around the globe. BCE's ITAR registration, coupled with its 2015 ISO-9001:2015 certification, demonstrates a serious commitment to the procedures and training required to provide the highest possible quality products and services to the Defense contracting industry. Hayward, California - May 12, 2015 - Belilove Company-Engineers, Inc., a California based manufacturer's representative, value added component integrator, electric thermal systems designer, distributor of control valves, and process instrument representative, announced today that it has been recognized for its commitment to quality and excellence by being certified in accordance with ISO 9001:2015.